Creating my everyday: Do you like ribbon? Luxe is having an amazing ribbon sale right now - you can get three yards of ribbon for $1 or a 20 yard spool for $5! You can check it out here. Speaking of Fancy Pants, this is a recent layout I did mixing several lines, including the new Summer Soiree line. That awesome scalloped border stamp is also from the new Summer Soiree stamp set. This LO was also done for the latest prompt up at the Forward Progress blog. Btw, I forgot to mention in my last post that it was my 100th blog post, wow! I plan to do a RAK to celebrate, so keep an eye out! Happy hump day, everyone! hey you - super cute layout - love the circle and the title! Congrats on the pub! And on the ST pub request for July-- I'll be keeping you company there! 100 posts... you are a bloggin' fool, girlio! ;) Looking forward to the RAK chance! you are too cute. how do you get such good pics of you and tony? do you do them yourself? LOVED this new LO of all of you! Hey girlie, congrats to you on the 100th post and the publication! I adore Scrapbook Trends and will be keeping my eye out for your LO in July. Just love your LO and the journaling is so touching!!!! Have fun at your crop and can't wait to see your creations!!! Happy Thursday! Congrats on your pub, Staci and the layout is so adorable!! Love those new papers! That is a great photo! Congrats on the publications and your 100th post! Scrapbook Trends is one of my favorites, so I'll be looking for ya! 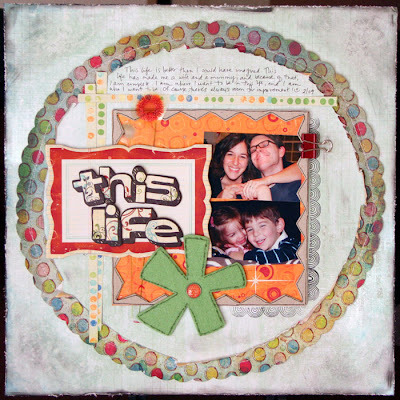 I also saw your layout on Teresa Collin's blog...just awesome! why yes! yes i do like ribbon! congrats on the st mail! Gorgeous layout!!! I love it!! this is such a cute layout!!! congrats on the pub!! Love the LO Staci... congrats on the 100 posts!!!! Such a cute LO! Congrats on the ST pub! congrats Staci on your pub! Love the layout and the great pics of you and your hubby and the two kiddos! too cute!!! A BIg CONGRATS to you girl!! You rock!!! Does it get any cuter then this? ?